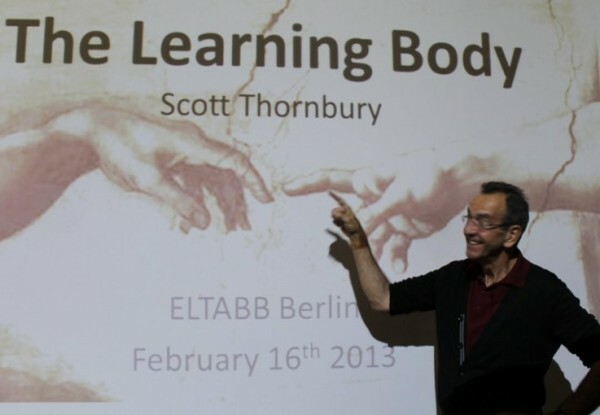 This was not Scott’s first talk to ELTABB members and he expressed concern that he was running out of ideas – however I didn’t detect any sign from his audience that they had “heard it all before”! Scott explained that since Descartes, the mind had been seen as divorced from the body but cited Mae West, “I speak two languages – English and body” to introduce the idea that languages are learnt and spoken as much with the body as with the mind. Scott showed how much of our figurative use of language is linked to our body – we talk about things looking up, about walks full of surprises, looking back on the past – and that many of our metaphors are linked to ideas of containment and boundedness, as experienced through the body. He quoted Lee, “Language is rooted in human experience of the physical world.” He suggested that this could inform our teaching of e.g. phrasal verbs – that instead of grouping them by the stem, as was often the practice, we should teach them by focusing on the particle e.g. up / on and focus on the meaning represented by that particle., e.g. up signifies an upward movement but can also signify completion. Scott also referred to research by Lindstrom and Boers showing that students retain learning better if they make movements associated with vocabulary and that research also shows that students who only watched others making the associated movements also retained vocabulary better. Scott referred to Adrian Underhill’s posts on his “A-Z” blog and on the Macmillan site in which he stresses the importance of articulating pronunciation to be learned, “Take pronunciation out of the head and into the body”. Scott explained how language is always embedded in context. He referred to ecolinguistics and likened the learning of language to the learning of soccer by children (and incidentally explained this so well that even I, with zero knowledge of, and even less interest in, any ball sport, could follow the argument!) He showed some fascinating footage from a TED talk by Dev Roy who videotaped his small son’s early language to show in which parts of the house various language was learned. I had to smile here as I imagined which words could be learned by a child in our house – all sorts of bad language emanates from our kitchen! Scott explained theories that we adapt our language to different circumstances and different people (linguistic accommodation and co-adaptation) both consciously and unconsciously. Scott opened this session with a still from the film Memento in which a man tattoos his body , literally using his body to help him remember! He also introduced us to Andy Clark’s memorable metaphor of the body which should not be seen as an input-output sandwich with cognition as the filling but as a body leaking out into the world. In this session, Scott examined the use of gesture as a “coupled system” with thinking and talked about the differences between gesturing in different languages – did you know that French, Dutch and German people use different gestures to accompany certain verbs? And that those same people’s gestures change when they have learned each others’ languages? We learned that there are many different reasons for gestures and that most people gesture more and for different reasons in a second language, that language probably emerged from gesture and that humans use gesture when there is no communicative need to e.g. on the telephone or in the dark (Scott was not able to explain how anyone knows the latter!) Scott referred to the self-regulatory function of gesture – helping us to organise our thoughts, which has implications for our teaching. Finally, Scott talked about Alignment. He showed us a clip of Penelope Cruz being interviewed by David Letterman and her use of her body to show alignment with him and what he was saying and to distance herself from them. Scott referred to familiar concepts such as the importance of our physical relationship to our students – e.g. whether we loom over them or crouch down beside them but also about scaffolding – how we can build up our students’ learning , not just by words, but also by gesture. He explained that imitation is the first stage in appropriation, and that we imitate first the gestures and then the language. This was a fascinating talk. It generated a lot of discussion when we split into discussion groups. During the talk, I noted down the titles of some books which Scott referred to. For anyone else who is interested, I have added them here.